District city in the government of Kovno, Russia. In 1780 CountNikolai Tyszkiewicz by cutting down a forest that lay between New and Old Poniewicz: helped materially in enlarging the city to its present size and in founding the suburb Nikolayev. Poniewicz came under Russian dominion after the last partition of Poland, and it became a part of the government of Kovno in 1842. More than half the population of the city consists of Jews, and there is also a small Karaite community. In 1865 the number of inhabitants was 8,071, of whom 3,648 were Jews including 70 Karaites. By 1884 the population had increased to 15,030, including 7,899 Jews, but in 1897 the total population is given as 13,044. Poniewicz has one synagogue built of brick and seven built of wood. The Karaite community also maintains a synagogue. Of other institutions in the city there are a government school for Jewish boys, one for girls, a hospital (opened 1886), and a Talmud Torah. There are in addition numerous other communal institutions and societies. R. Isaac b. Joseph (d. before 1841), whose name is signed to an approbation in the '"Aṭeret Rosh" (Wilna, 1841), is one of the earliest known rabbis of Poniewicz. 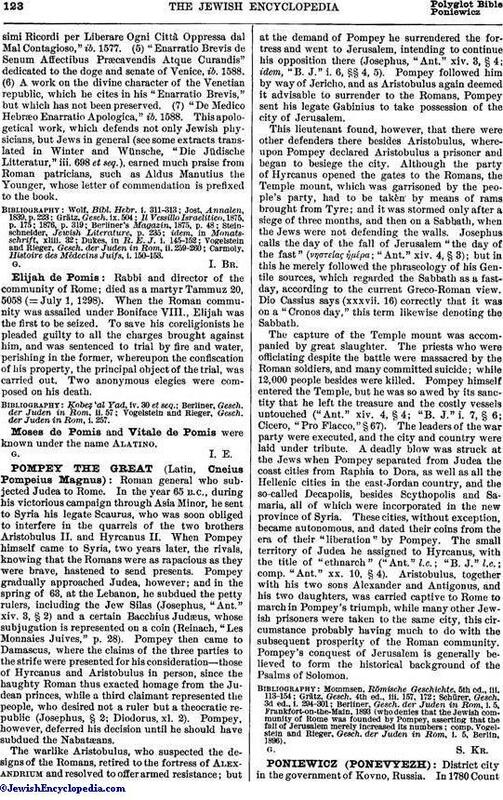 R. Moses Isaac, of Libau, Plungian, and Taurogen, was probably his successor, and was himself succeeded by R. Hillel Mileikovski or Salanter. R. Elijah David Rabinovich-Te'omim succeeded R. Hillel. He was born in Pikeln, government of Kovno, June 11, 1845, and now (1904) is rabbi at Jerusalem. Rabinovich occupied the position of rabbi of Poniewicz from 1873 to 1893, when he went to Mir as the successor of R. Yom-Ṭob Lipman Boslanski. The poet Leon Gordon commenced his career as a teacher in the government school of Poniewicz, where he remained until 1860 and married the granddaughter of one of its former prominent citizens, Tanḥum Ahronstam (died Nov. 10, 1858; see "Ha-Maggid," ii., No. 50, and Gordon's letters, Nos. 1-36). Isaac Lipkin, son of R. Israel Lipkin (Salanter), was also a resident in the city until his death. 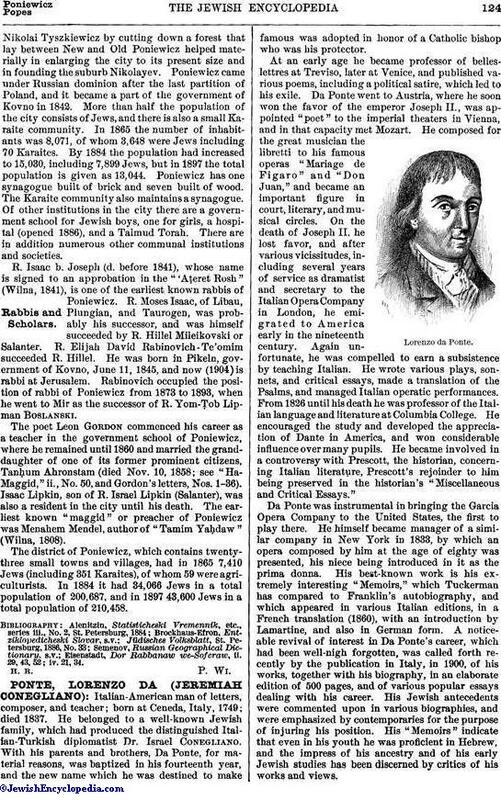 The earliest known "maggid" or preacher of Poniewicz was Menahem Mendel, author of "Tamim Yaḥdaw" (Wilna, 1808). The district of Poniewicz, which contains twenty-three small towns and villages, had in 1865 7,410 Jews (including 351 Karaites), of whom 59 were agriculturists. In 1884 it had 34,066 Jews in a total population of 200,687, and in 1897 43,600 Jews in a total population of 210,458. Eisenstadt, Dor Rabbanaw we-Soferaw, ii. 29, 43, 52; iv. 21, 34.